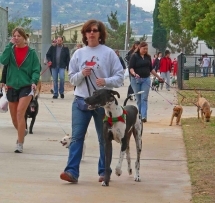 December 5, 2009 (El Cajon) – It was a frisky romp through Wells Park this morning, where I joined a pack of other dogs and their owners in the first-ever “Jingle Paws!” walk to benefit El Cajon’s Animal Shelter. Much to my delight, I discovered even more entertaining activities—such as a canine agility course, bobbing for hotdogs, vendors selling every imaginable gift item any dog could want, and even a visit from Santa Paws…er, Claus. 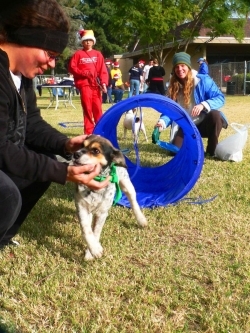 The event was a tail-wagging success, raising over $4,000 and attracting far more entrants than the 100 goodie bags in stock. Participants could choose from several levels ($15 to $50), which explained why some entrants sported T-shirts, others wore holiday bandanas, and still others trotted along in home-made holiday fashions. After a rousing figure-8 loop of the park (which also has an enclosed dog park area where well-behaved dogs can run freely off-leash year round), I tried try my skills on an agility course. I tripped over the first hurdle, knocking it over. The second time I decided to sneak around—not over—the hurdle. Then I watched a young pup take a running leap and clear it with ease. After that, I stepped lightly over the barrier (ok, so being an 80-pound golden retriever has its advantages over those miniature breeds). Then I did a doggone fine job of completing the rest of the course—which included a tunnel to crawl through and a straw bale maze. Next, we played a game similar to musical chairs, only with spots to stand on. “Losing” was the best part, since every dog got a treat! Being a retriever, however, I dived in muzzle-first for my fair share of submerged hotdog bites at the “bobbing for dogs” tub. I got my photo taken for a canine ID program, so if I ever get lost, my master will have some flattering pictures on hand. Inside Santa’s Village, seeing Santa was a real highlight – though his fur coat was even redder than mine! I’m told the kindly St. Nick was portrayed by none other than Drum Macomber, El Cajon volunteer extraordinare, who suited the jolly role to a T-bone. 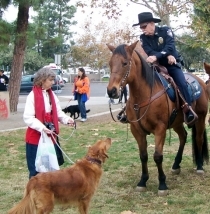 I went nose-to-nose with some big horses from the El Cajon mounted police. 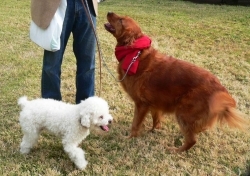 There were lots of other rescue breed groups on hand, too, plus opportunities for folks to adopt a homeless dog just in time for the holidays. My favorites were some “gentle giants” at the Leonberger Rescue booth. One dog tipped the scales at a whopping 190 pounds (photo, below). I felt like a chihuahua by comparison. A lady with a spinning wheel was making some beautiful soft scarves and sweaters out of all that dog hair, which is called chingora. Maybe because it's soft like a chincilla and angora wool. But hey, why not doggora? We browsed for a while at various vendor booths, where you could find everything from dog toys to earrings of every conceivable canine breed. Lots of those nice vendors gave me treats, too! The event was co-sponsored by Camp Bow-Wow (a doggie day care center) and the ACES Foundation, which pays for surgeries for injured shelter animals. Donations poured in from local companies, too, including Petco, Starbucks, Einstein Bagels, Howard's Bakery, Silver Creek Fine Art Framing, Von's, ResMed Corp., San Diego County Credit Union, and officers from El Cajon Police Department. It sure felt good to help out all those less fortunate dogs and cats in the shelter—and I had a doggone great time, too. Two paws up for this awesome event. I sure hope the sponsors will bring back Jingle Paws next year! What a pleasant surprise for El Cajon and Wells' Park. If this was the First annual I can't wait to see what happens next year. There was so much to do for kids and dogs alike. 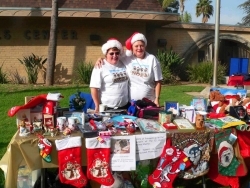 What a wonderful thing you planned for the East County Aces foundation and Camp Bow wow. Lily had a good time she wants more. My name is Pepperoni and I'm a "rescued-dog" from Santee. 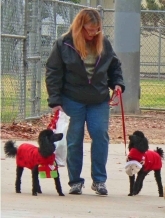 I took my daddy to Jingle Paws - we had sooo much fun. 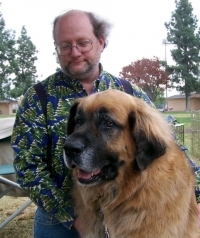 I met a giant Leonberger and Gomez the tiny Chihuahua. I even met a distant cousin who looked just like me (with a better haircut). I say let's keep in touch. 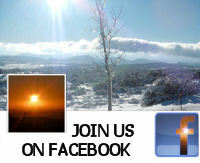 Join the Dog-Blog with Penny and me on East County Magazine. We can share recipes, best doggie hotels, trails and anything that crosses our minds (besides eating and sleeping).